This Malay kueh also known as Kueh Kemboja is our family favourite. My brother used to buy it from a Malay shop near the Kajang wet market. This is the second time I made this and I was surprised that Carlos likes it. Normally I can't even get him to try any kueh I made. Since he likes it I will make this more often for him. 1) Pre-heat oven to 325 degree F and greased a baking pan. 2) Mix all the above ingredients except sesame seeds until well combined. 3) Pour mixture into baking pan and sprinkle with some sesame seeds and bake until golden brown or skewer comes out clean when tested. It should take an hour. 4) Cool it down before cutting. Note : Pandan leaves or screwpine leaves are widely used in South East Asia cooking to add distinct aroma to rice, curry or desserts. If you can't find the leaves you can used Pandan paste which can be found at Asian store. (put up my hand)teacher, teacher, I also want a piece! "so sedap lar cannot tahan!" surprise jugak carlos suka makan kuih bakar ek? 1 question tho, whts the substitute for pandan paste? PJ, I am sure you can get frozen pandan leaves at CA. Check out the Asian store there. Aiyo..sifu..kuih bakar pun boleh buat arh? ?..kasi tabit ooo...How it taste?.I dunno I every try it b4...sudah nyanyuk.hahaha! !I like the green color. Beachlover, this is a very easy kueh to make. Just mix everything and bake it. I LOVE this kueh bakar! btw Gert what size baking pan you use ? Envy, I used 8" x 8" square pan. I love this kueh. I made it couple of times. Is this kueh only available in Malaysia? I am an Indonesian married to a Singaporean. My husband said, he has never tasted this kueh before. Thanks so much for the recipe. Manyaro, thanks for stopping by. 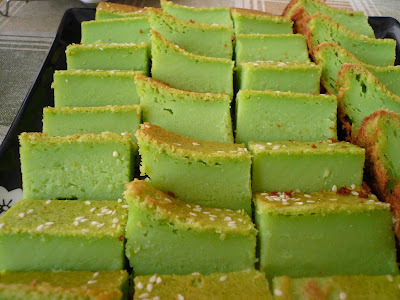 Yes, this kueh is available all over Malaysia and mostly eaten by the Malays. hello. how much pandan paste to substitute for the pandan juice? Alienstar, you can about 1 1/2 tsp of pandan paste. hi, today is my 3rd attempt at kuih bakar and i am most succesful with your recipe. i tried another one twice but the result werent satisfactory. thanks for great recipes from yr blog.keep it up. btw, those recipes that i have tried from yr blog have not failed me thus far. ThankS!! Great recipe. Cured my craving for kuih bakar. Sedap...and my kids enjoyed it very much. Soft and just the right amount of sweetness. Will post this on my blog...used muffin pans instead of a cake tin. Deanna, I am glad that you like the kuih bakar and thank you for your support. Za, glad that your family like the kuih bakar. Enjoy your blog and thanks for sharing your recipes. Can you please tell me what kind of flour to use? I used regular all purpose flour. Thanks for sharing this lovely recipe. My kueh bakar turned out successfully.I intend to try out other recipes too. Can this be kept at room temperature for a whole day (12 hours or more) or it is better to be refrigerated? Thanks! Beautiful Vancouver, thanks for trying this out. Jess, not sure where you live but the temperature here is not so warm so I do keep it at room temperature for a day without refrigerating it. If you are in hot weather it should not be at room temperature for over 8 hours because of the coconut milk in it. It might go bad. I made this eventually and kept it out for ~6 hours in summer, everyone loved how it wasn't too sweet. I had to put in the oven for 1.5hr as i forgot the time, the top turned dark brown but contrasted well with the sesame seeds and tasted very good. Thank you very much for this recipe, now I am off to try baked cassava. Can you please tell me 1 cup is how much to substitute in gram or ??? The recipe already has 1tsp of Pandan paste. So, if I substitute the pandan juice with pandan paste, I will be using a total of 2 1/2 tsp of pandan paste? (read in the comment that the p/juice = 1.5tsp of p/paste). Am I right? Thanks a lot! Anon, the above commenter asked if she can substitute the juice with just paste and I told her she can use about 1 1/2 tsp of the paste. That mean instead of 1 tsp like the recipe said she need to use 1 1/2 tsp. But all this depend on the panda paste you will be using as some might give you a strong flavor and color so you can always use more or less. Anon, yes I used the Butterfly brand too. 1 1/2 tsp should be enough. You might want to omit the green coloring though. Thank you for sharing this recipe. My friends and I were using this recipe when we had Malaysian gathering. It was good! Somehow, we had lost the recipe and cannot be more thankful to find this on your website.